A close-up view of the wheel of the Chang'e-4 rover 'Yutu 2 (Jade Rabbit 2). Photo is courtesy of CLEP/CNSA. Journalist Andrew Jones of the gbTimes infosite, has posted a story highlighting China's Chang'e-4 mission and the mission's rover has rolled down from the lander and onto the lunar surface following the nation's historic landing on the far side of the Moon from the Von Kármán crater landing site. 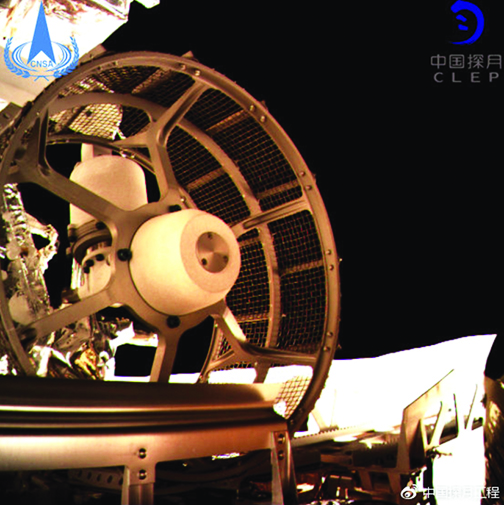 The lander has returned the first-ever images from the surface of the far side of the moon, with images from its descent and others cameras sent to Earth via the Queqiao relay satellite. Almost 12 hours later, the China Lunar Exploration Project (CLEP) announced that the rover had descended from the lander at 14:22 UTC. CLEW also revealed that the rover would be named Yutu 2 (Jade Rabbit 2), following on from the rover for the Chang'e-3 mission which landed on Mare Imbrium on the near side of the Moon in December of 2013. The name was derived from a public contest to elicit names, a vote from a shortlist and a final decision by a committee.